In a large bowl, whisk together heavy cream, milk, eggs, vanilla and rum. Add sugars and 1 teaspoon of cinnamon and whisk until combined. Add bread cubes to the bowl and carefully stir, ensuring that each piece is soaked in the mixture; set aside. Toss the apples with remaining 1/2 teaspoon of cinnamon. Place half of the soaked bread cubes in a buttered 9x13 baking dish. Top with cinnamon apple slices. Place remaining bread on top; lightly press down. Let sit for 30 - 60 minutes (or overnight). Bake at 350 degrees 45-50 minutes or until set. Meanwhile, place caramel and bourbon in a small sauce pan. Heat over medium-low heat for about 5 minutes until caramel thins. 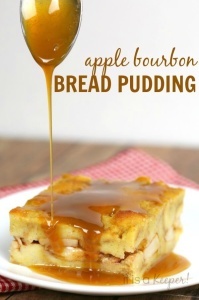 Drizzle Bourbon Caramel Sauce over the warm Apple Bread Pudding; serve immediately.